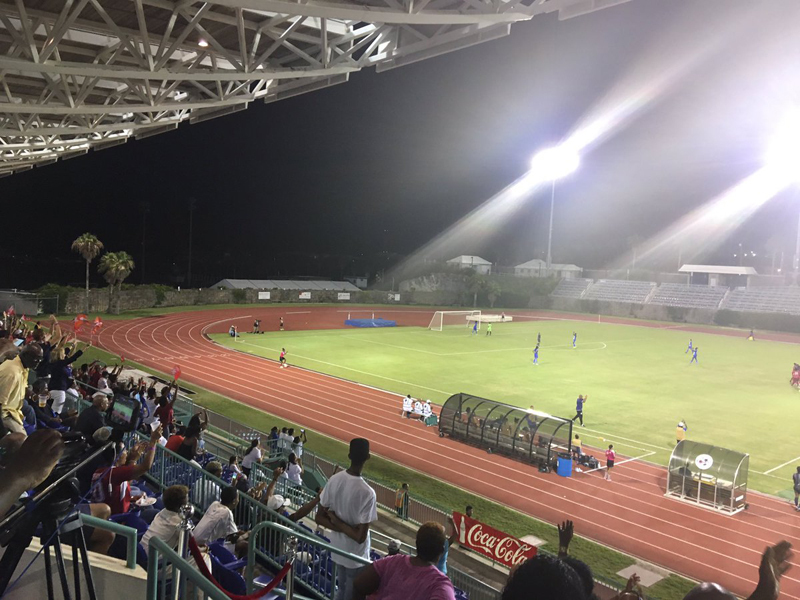 Bermuda won against Curaçao in their opening Concacaf Caribbean Women’s Under-20 Football qualifier at the National Stadium last night. Deshae Darrell scored the team’s opening goal of the night and substitute Adia Gibbons scored the final goal, finishing the game 5-1 to Bermuda. The remaining goals were accounted for by Teyah Lindo and substitute players, Nia Christopher and Jahzyiah Samuels, while Kiara Snel scored the goal for Curaçao. Christopher, who replaced Loew Darell after half-time, put Bermuda up 3-1 over Curaçao with just over seven minutes left in the game. Shortly after, Darrell came off the field to be replaced by Samuels, who quickly scored the fourth goal for Bermuda. This is followed by a series of four shots saved by Curaçao goal-keeper Guillermo in the space of about 30 seconds. In the final three minutes of extra time Gibbons, who replaced Bermuda’s, Jade Stewart, slapped the ball into the left corner scoring the final goal for Bermuda. Curaçao’s team was significantly weakened by the loss of striker Staygin Stephens who was taken off the field on a stretcher with a knee injury. Stephens was injured in a tackle late in the game with Bermuda leading 2-1. Her loss did not go unnoticed with Bermuda taking advantage of Curaçao’s weakened team, scoring three goals in the final ten minutes. The team will be back in action on Sunday [July 23] at the National Sports Center competing against Jamaica. Arguable the best game that I have witnessed in many years. Our young ladies are talented! Our goal keeper is phenomenal. They played to the whistle, as a team without selfishness and there was not one sign of conduct unbecoming even when multiple questionable calls were made by the referee. The stadium had a respectable crowd and for the majority of the game we were on our feet or on the edges of our seats. Our support however could be that much better on Sunday. I encourage every resident to come out and support the Bermuda team on Sunday night. These young ladies represent something to be extremely proud of on so many levels. Wear your red and blue! Looks like some decent numbers turned up on a weeknight… should mean a bigger crowd for the weekend matches. Go get em, Bermy.